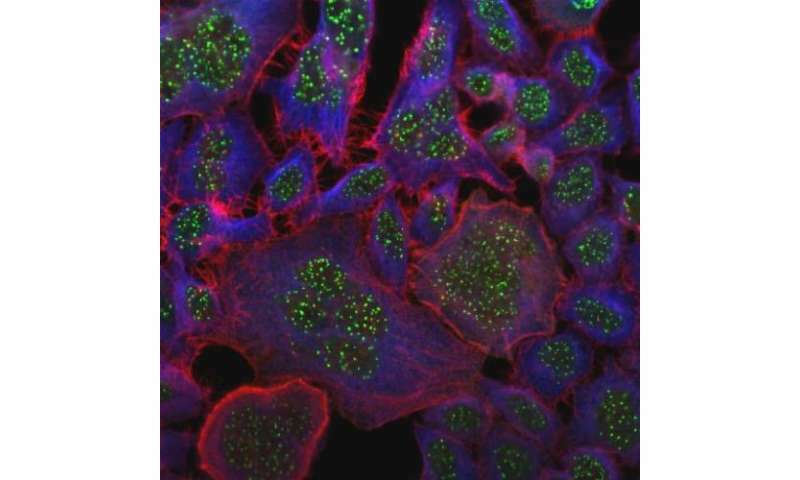 The image shows cancer cells where the number of chromosomes in each nucleus is not as it should be -- a condition known as "aneuploidy." The green spots show a marker for the chromosomes, and the red and blue fluorescent stains highlight two different parts of the cell's internal skeleton. Credit: Image courtesy of Dr Nicola Brownlow and Professor Peter Parker from the Cancer Research UK London Research Institute. Cancer Research UK scientists have discovered a new line of defence used by cancer cells to evade cell death, according to research published in Nature Communications today. The team identified a critical pathway of molecular signals which throw a lifeline to cancer cells, enabling them to survive even though they contain vast DNA errors which would usually trigger cell death. The PKCƐ signal pathway (Protein Kinase C epsilon), which is used by cancer cells but rarely by normal cells, could be important in targeting some cancer cells as they rely on this pathway to survive. The pathway helps the cancer cells survive by allowing them to untangle and separate their DNA. Cancer cells rely on this signal pathway more than normal cells because their DNA is more jumbled and prone to becoming tangled. Turning off the pathway can trigger cancer cells to self-destruct because the machinery used to untangle the DNA fails, meaning it is torn apart as the cell divides - ravaging and causing huge breaks in the code which lead to the cancer cells' demise. Lead researcher Dr Nicola Brownlow, Cancer Research UK scientist at the Cancer Research UK London Research Institute, said: "Taking out this line of defence could be a powerful way to target the disease and re-programme cancer cells to self-destruct. "The next step in our research is to understand which cancer types have this weak spot and to look for a marker that will allow us to test patients for cancers with this fault." Nell Barrie, Cancer Research UK's senior science information manager, said: "This research has uncovered an important weakness which we could use to tackle cancer. Newer, precise methods which target the dents in cancer's armoury provide fresh opportunities for better treatments to help more people survive the disease. "There's still a lot of work to do before this research leads to a new cancer treatment, but it offers us a new strategy to beat the disease by helping us to understand what causes and drives cancer." More information: Brownlow et al. Mitotic catenation is monitored and resolved by a PKCε-regulated pathway. Nature Communications. DOI: 10.1038/ncomm6685.